This week’s SLUG Soundwaves features local math rock band Form of Rocket. If the name rings a bell, it’s because they’re no newcomers to the local music scene here in Salt Lake. Since forming in 2000 and then taking a hiatus, Curtis Jensen (guitar/ vocals), Peter Makowski (guitar/vocals), Tyler Smith (drums) and Ben Dodds (bass) are back for this year’s Crucialfest. Along with playing Crucialfest, they will also be rereleasing their first record, Se Puede Despedir A Todos, on vinyl, with only 250 pressed copies for purchase. With the help of Justin Reynolds who provided the album artwork and Andy Paterson who remastered the album for vinyl, Form of Rocket have been able to pull this all together in just a short amount of time. Reminiscing on their earlier shows, Makowski questions, “People were so into the music, especially at Kilby,” he says. “Was it the music we were playing or was it the time period?” Having gained the attention of Salt Lake locals, Form of Rocket were playing shows to rooms packed full of people. “For all the vocals we had on that record, I would say maybe 40 percent are actual lyrics,” says Makowski. When it came time to do a lyric sheet, they had to go back and listen to the record and write down what the vocals were. Jensen and Makowski were adventurous with their lyrical content—they wanted to create a record of songs that built and released tension in an effective way. After that, Jensen had left the band to pursue other desires but came back to record vocals for Men. Jensen, who’s in town and set to get hitched, has moved around quite a bit. 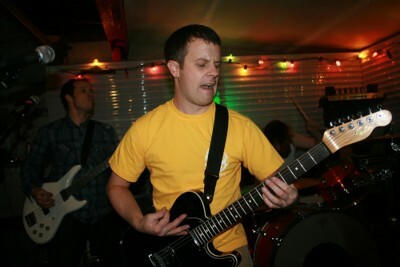 In 2011, he had moved back to Salt Lake after spending some time in Alaska and got everyone back together to play some shows. Having returned, Form of Rocket are ready to get back in the music game and dazzle the audience once again. Form of Rocket will play at Kilby Court on June 11 and Urban Lounge on June 17. You can also check out their responses to some fans favorite Form of Rocket memories here.